If you’re a supporter of the Republican Party or President Donald J. Trump, chances are good you were very optimistic and even hopeful that major changes would be coming to Washington, D.C., after the GOP kept its congressional majority and Trump defeated Democratic nominee Hillary Clinton. Though it’s still very early in the Trump presidency, we can already see that Republican lawmakers do not have the will, backbone or unity to govern our nation, and that’s not going to bode well for the president’s agenda, which, by the way, allowed him to win more electoral votes in traditional Democratic states than any other Republican presidential nominee since Ronald Reagan. Republicans “lack the unity, mindset and political will to make the hard choices required to govern,” the Washington Examiner reported, citing interviews with veteran House Republicans and aides. The healthcare breakdown is just another symptom of this broader political virus that seems immune to all antibodies, including President Trump, the Republican who took up residence in the White House in January. “The failure here has not been in our leadership, it’s certainly not been in the president, it’s been in our inability to overcome our own differences and our lack of trust in one another,” Rep. Tom Cole, R-Okla., told the site. Voters have given the GOP a historic majority in the House – 247 seats out of 435, their largest majority ever. All that is needed to advance legislation is 218 votes; apparently, even a 29-seat cushion isn’t enough. The $1 trillion spending bill now nearing final approval in Washington D.C. proves beyond any doubt that Washington cannot be fixed by Washington. It is beyond reform… and beyond the hope of even the most optimistic. The corruption is so deeply ingrained in the system that even well-meaning individuals like Rand Paul are overrun by the swamp monsters who dominate the establishment. Republican or Democrat, it’s all one big, fat, corrupt party now: THE PARTY OF BIG GOVERNMENT. Adams noted further that despite being given clear mandates by a majority of voters, Republicans are tone-deaf to it, and instead have been hopelessly co-opted by big corporate donors, K Street lobbyists and other special interests that have little interest in fixing big problems. “The Republican party, in particular, has now been exposed as a massive con that falsely promised to cut the size of government… but only as rhetoric, not reality. 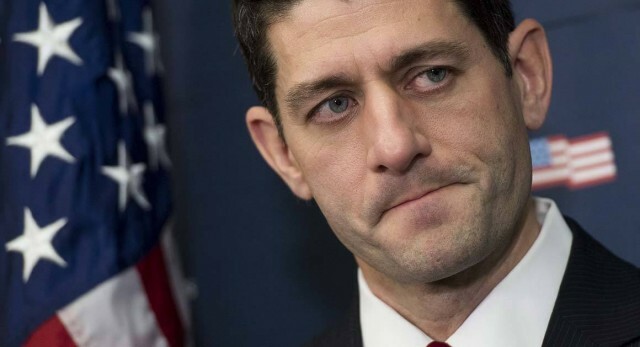 The same party that sent half a dozen ‘repeal Obamacare’ bills to the White House during the Obama administration now can’t seem to finds its own scrotum for long enough to send the exact same repeal bill to the desk of President Trump,” he wrote. Indeed, as reports today noted, even with changes to the original repeal bill – the awful American Health Care Act – there are still not enough Republicans who will support it (not a single Democrat is likely to vote for any repeal-and-replace measure, since Obamacare was passed without a single GOP vote). “We have got to start governing, and legislating the Trump agenda,” a frustrated Rep. Ann Wagner, R-Mo., told the Washington Examiner. Adams doesn’t see that happening anytime soon, if at all. Republicans have a simple choice: Get it together and govern or get the hell out of Washington, D.C. We have a country to save, boys and girls, and if you’re not willing to help, you’re just taking up space for another Republican who is willing to step up. We’ll see if that happens, but we’re not holding our breath.